Jamie Chase is a subject of the Phoenix Project. IN this program the top agents of PRD are cloned and when they are cloned their DNA is mixed with Alien or mutant. Giving the clone almost any power that PRD wishes. The first of these clones only lived for a year or lease, but as time went on they found way to make them live longer and longer. As of now there has been 234 clones of top agents. But only three that have seen the field and real action. the first being a clone of Robert Nightshade, a man that was PRD's top agent for 4 years before dieing on a mission. Second is subject 233:Jamie Chase. the clone was give super strength and toughen skin, hard enough to stop bullets and blade from cutting her. along with the power she was given all knowledge of weapons and fighting style. She was sent to Void City to study other paranormal beings to see how PRD can deal with them if needed, or how to take the powers they need from them. the Third being subject 334:Jamie Chase, after the last subject was controlled by a vampire ( see Vencil Le' Martees fights to know about that http://entervoid.com/arena.php?bid=336 ) and disbanded from PRD, she went out of her way to know who she was. but failed after having a child by the Vampire. with the mixed DNA of the beings in her DNA and the child's father the child grew at a extreme rate. and had power that of his father's. Her son later faced a foe and was taken down in front of his mother, who turned truly evil at the sight of losing her son. ( see the Fushigi fight for that one. 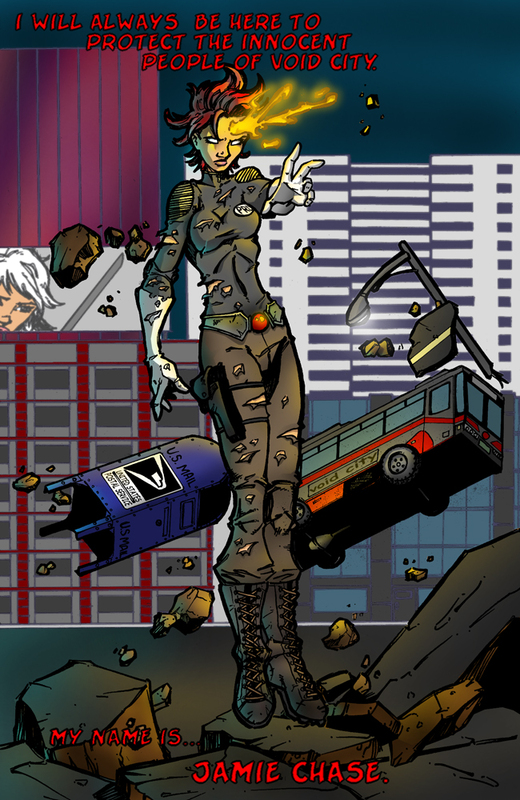 http://entervoid.com/arena.php?bid=893 ) she destroyed an entire city block before PRD agent came in to contain her. After getting her son and her back to PRD they took Jamie's heal factor and switched it for some of his "weaker" vampire powers. They in plated the healing factor it into her son to help his healing. but as a result he was awaken and broke free from PRD. the subject known as Jamie Chase was placed in deep sleep in case she was needed later. Subject 333:Jamie Chase was made to chase and catch subject 332's escaped son. She was given all the memories of the original Jamie Chase, and was also making her a strong telepathic and given the power of telekinetic. This was done to lower the chances of her getting brainwashed by subject 332's son. As was told of the plans of PRD she was also reunited with her son, Hunter Chase. who's plan was still to find his sister. power: Jamie Chase has a large knowledge of weapons and fighting styles. she is a very powerful telepathic and has the power of telekinetic. Jamie possesses telepathic powers which allows her to read minds, project her thoughts into the minds of others. And if she tries hard enough she can stun the minds of opponents with the telepathic power. she can also shot blots of telepathic energy they call "mental bolts.". she can also make force fields and levitate herself of objects around her with her telekinetic abilities.